This month has been a very busy one! I've had a lot of fun, been here there and everywhere and it's now 10 days until I go away. I've had to start saying my goodbyes now but I don't think it has all sunk in - I'm going to be away for a long time and that doesn't seem a reality just yet. I had a spontaneous outing to the Maze in Nottingham for a gig night with Katie, Luka and Katie's Dad (who is the coolest dad, might I add!) I hadn't met Katie's Dad before but he was in Nottingham for the weekend so we had a night out, watched a few bands and had a few drinks. My Dad and I went Segwaying for his birthday. It was GREAT! I would definitely recommend to anybody to give it a go. They even offer big group bookings for businesses, families and groups of friends. I ventured to Leicester for a few days, which started with a night out and ended with me staying much longer than I had anticipated. I had a lovely time and it's always nice to explore a new city. I also went to Manchester for Hannah's leaving party which was a perfect opportunity to catch up with some of my uni friends. Now we've all moved back home or moved away, it's nice when we do the chance to get together. While I was in Manchester, I also managed to fit in the best burger I've had for a long time at at CockaDoodleMoo. My favourite expedition this month was our little trip down to London for Notting Hill Carnival. I cannot believe I haven't been before - I already can't wait for next year. I had the best Bank Holiday weekend - not only did I go to Carnival but I had a little down time with Ma and Pa. It was loveeely! I shared a little insight into my healthy eating and the past issues I'd had surrounding food, exercise and maintaining a healthy lifestyle. My work colleagues and I made a GREAT decision one lunch time and ordered food from Amigos on London Road (pictured top right). Sheffield truly has the greatest, widest variety of foods available. I cooked some delicious recipes - sweet and savoury including my Go-To Brownie recipe which always goes down a treat. 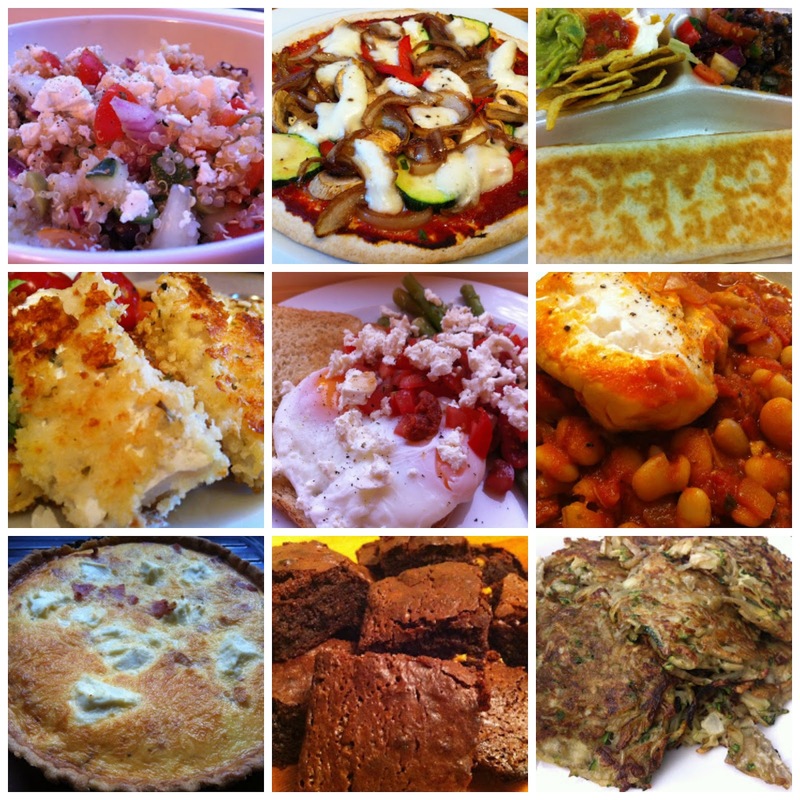 From left-right - Mediterranean Quinoa, Skinny Pizza, delicious Amigos food, homemade fish fingers, my beautiful poached egg, asparagus and feta recipe courtesy of Petitenget in Bali, Spicy cod stew, Bacon and Ricotta Quiche, my Go-To Brownies and Courgette Fritters. What I've been wishing: that time would stop going too quickly! I cannot believe it's September already!